The State of New York has attempted to rectify this injustice by passing what is commonly known as “The Get Law” in 1983. In practicality, before receiving a civil divorce, the plaintiff must certify a removal of religious barriers document, effectively stating that all civil and religious obstacles preventing the defendant from remarrying will be dissolved. In addition to the document, at the time of allocution, the divorce ceremony, this statement is repeated on the official court record. This progressive legal intervention is commendable, however it often creates difficulties in halachic implementation. A get that is given under duress is invalid, and there are rabbis who consider the requirement of the Get Law to be a legal imposition that makes the get unkosher. 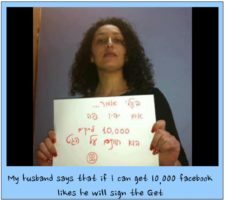 Furthermore, as the man is the only one who can give the get, if it is the woman who files for divorce she is obligated to sign the document, a procedure which is halachically useless. In 1992, a second Get Law was passed, granting the courts the discretion to use the marital assets to help an aguna. New York provides for “equitable distribution,” a division of assets that is “fair but not necessarily equal.” It is not predetermined that each spouse will get the customary half of the marital pie, the courts can divide the money and property in any way that it sees fit. In the hope of nudging the get along, a judge can show a husband the monetary consequence of his cruelty in withholding a get. While readily available, this option is hardly ever used, as judges are generally reluctant to upset the balance of equality. The Honorable Justice Jeffrey S. Sunshine, of the Supreme Court Kings County NY, has proved himself to be a welcome exception to this rule. The case involves my friend and her husband, a man who refuses to pay child support or alimony at the advice of Rabbi Dovid Borenstein, the Bashtiner Rebbe in Borough Park. In a courtroom battle that is almost four years long, the husband repeatedly states that he wants his wife to come back home and he refuses to give her a get. He filed for full custody, and he has gone as far as to bring their own children to testify against the mother at trial. In the hope of freeing my friend, I suggested that the wife’s attorney ask the husband on the witness stand if he intended to give the wife a get. It was a win-win solution: if the husband agreed to give a get and then reneged on his promise, his lies on the court record would be considered contempt of court, if he refused to give a get, his maliciousness would be undeniable. The husband’s testimony lived up to its expectations. The lawyer asked the husband about his intentions and he said that he would not give the get until custody was determined. When pressed if he would give the get after the custody decision, the man became very emotional and refused to answer, clearly demonstrating his refusal to release his wife. The wife was hopeful, but unfortunately there was no further movement with respect to the get, until now. Judge Sunshine recently issued the custody decision, clearing the way for the wife to ask for a get. This time, finally, the justice system was able to play a pivotal role in what we hope will be the end to a woman’s imprisonment. Judge Sunshine’s words to the recalcitrant husband were direct and to the point: “No Get, No Gelt!” The couple owns a home in Brooklyn, a multi-million dollar residence where the husband lives alone. If the husband continues to refuse to give the get, the judge was clear that the ENTIRETY of the house would be given to the wife.The mother worked hard to build a “Bayis Ne’eman B’yisroel,” the symbolic “True Home in Israel,” and with the help of Judge Sunshine, she will soon be released from her marriage. If he continues to hold her hostage she will get the financial security of the valuable property, while the husband will be left homeless, uprooted and powerless. I have had the opportunity to advocate for women in the secretive world of the “Bais Din,” the Jewish court system, where basic rules of procedure and evidence are conspicuously absent, where the only thing that is inadmissible is the testimony of a woman. There is no clear locational jurisdiction, and if the parties cannot agree which Bais Din to use, they turn to “zabla” – an ad hoc Bais Din created by each spouse selecting a judge partial to their position, after which the two biased judges jointly select a neutral third individual. Without exception, the Bais Din sessions that I attended were noisy, with brownie points awarded for yelling loudly and banging hard on the dining room table. The basic Noahide principle of establishing fair courts is for the most part lacking in the current implementation of Jewish law. While it is true that one can find justice in a Bais Din, those courts are few and far between in the ultra-religious world of the New York metro area. In theory, the Bais Din should play a pivotal role in the regulation of Jewish life, but in actuality, the inability to enforce decisions, the unregulated judges, and the many variants of halachic rulings, consistently ensure that a woman seeking a get is completely reliant upon the good will of her husband. Some women begin the process by compromising their children’s well-being or their financial future, while others keep trying until they finally realize that the only way out of prison is to pay off the jail keeper. Eizak v Eizak, 52855/10, Kings Civil Supreme, Brooklyn, New York. The marital residence is located at 1156 57th Street, Brooklyn, New York.